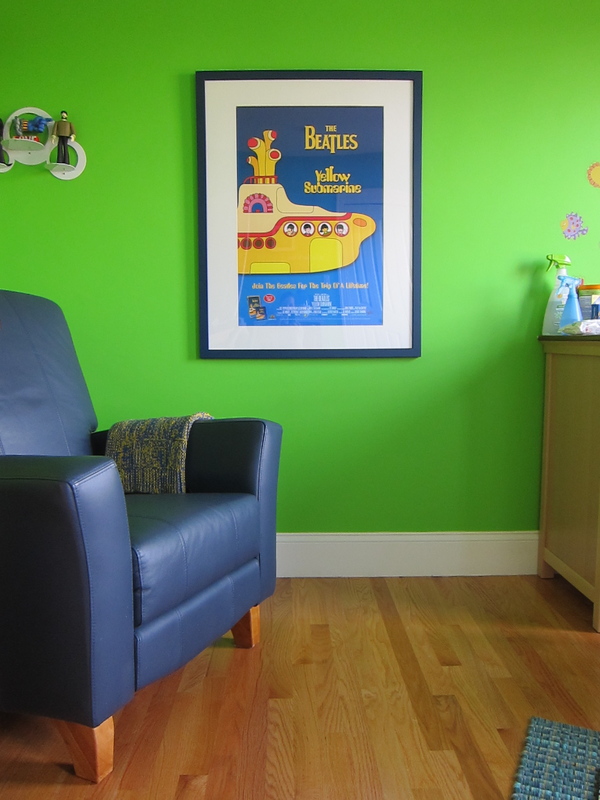 (Above) The focal point of, and palette inspiration for the nursery – a framed “Yellow Submarine” poster. My son still loves to look at it while I’m burping him, or just enjoying some quiet time in the glider. (Above) One of my beloved figurine vignettes. I had to scour Ebay and Amazon for months to find all of the pieces, and to get decent pricing. 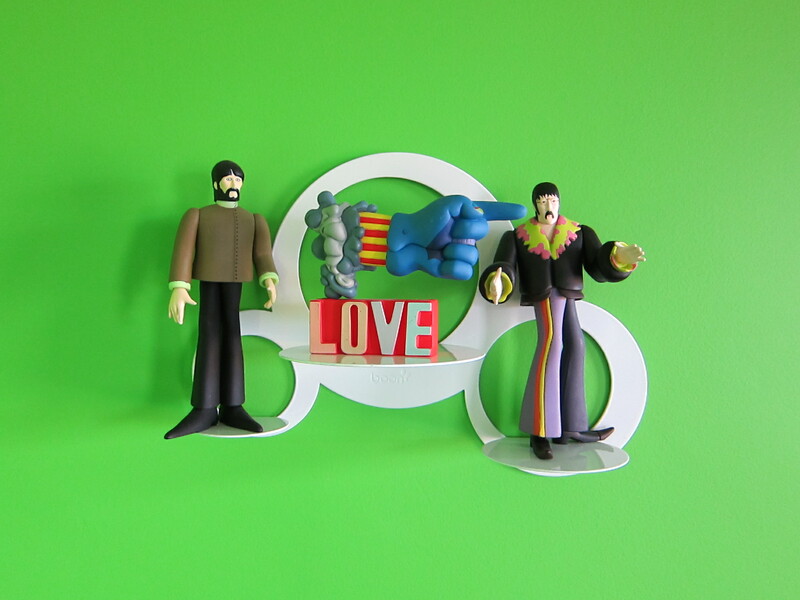 I was originally planning to place them on a ledge-type shelf, but when I found the bubble-shaped Boon Flaunt in two different sizes, I knew they’d be the perfect display for John, Paul, George, Ringo and friends. These “toys” on the wall elicited some of my son’s first smiles, and continue to delight him on a daily basis. That made it worth all the work, and then some! (Above) The changing station. I know, I know – the Fisher Price Ocean Wonders decals are not exactly the pinnacle of good design. 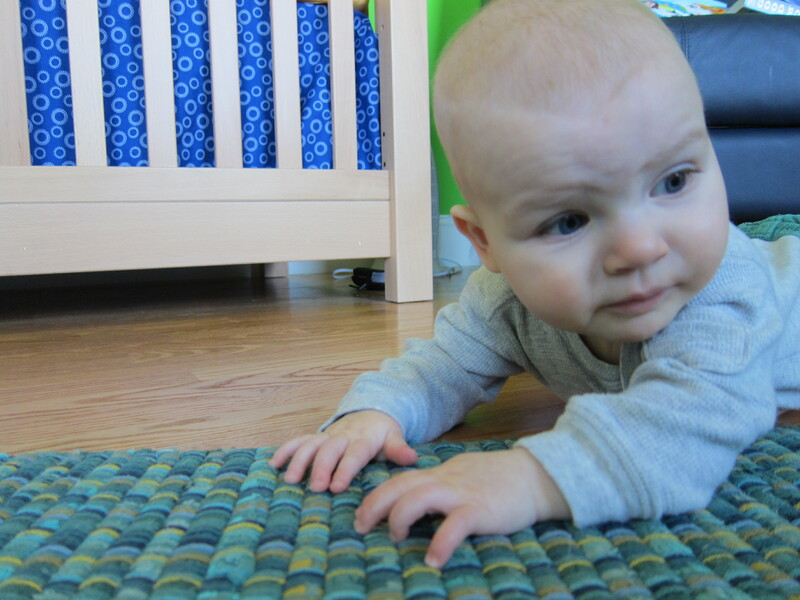 But I didn’t do this for me – I did it for Quinlan (my only current “client”)! And he LOVES it! I knew I wanted to put his name on the wall, so I spent countless hours searching for the right letters, in the right typeface – and then just asked Etsy’s Household Words if they could do a custom size and font (Yellow Submarine, of course!). (Above) AYellow Submarine nursery would not be complete without portholes! (Above) This is one of my favorite pieces in the room – and I can take no credit for it! 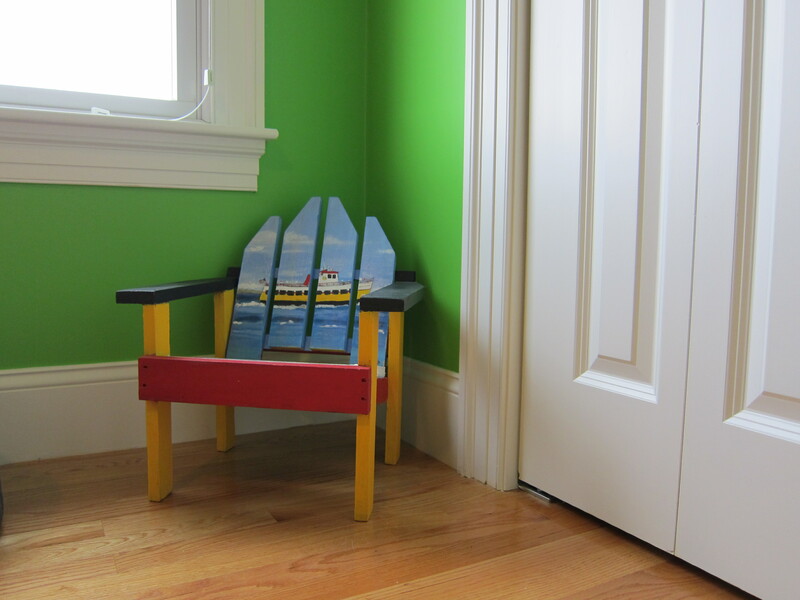 The mini Adirondack chair, hand-painted in Peaks Island, ME, was a baby shower gift from a good friend and her mother. It also helps illustrate one of the best things about the theme I chose – how versatile it is. 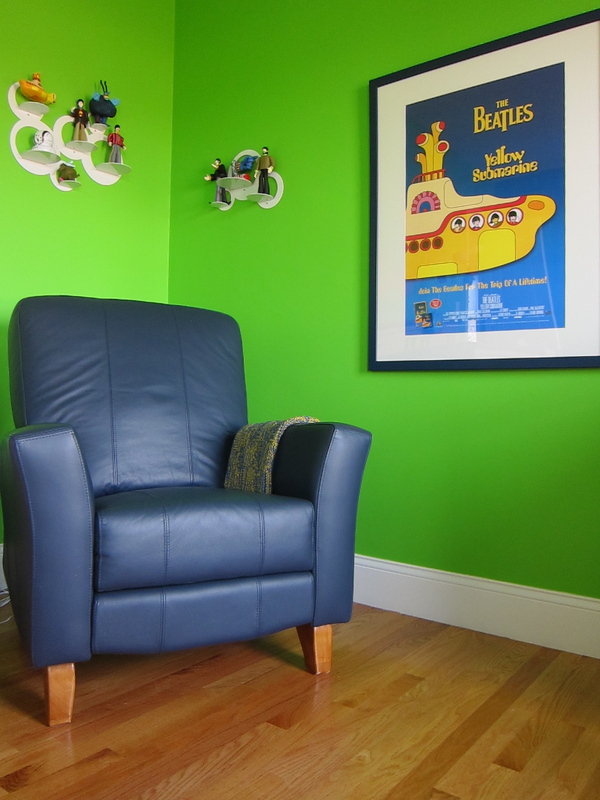 Any aquatic or sea-faring items are very much at home in the Yellow Submarine nursery. (Above) This bookshelf from Pottery Barn Kids isn’t that interesting in and of itself, but it was the perfect size and color for the small space I had in mind. The framed fish photography was a gift from Grandma, who snapped the pictures while snorkeling in Roatan while my little guy was still “baking.” Playing on the iPod, which is nestled in a color-changing iHome docking station: something from Howard Jones’ Human’s Lib. (Above) Yikes – sorry about the wonky lighting in this picture. 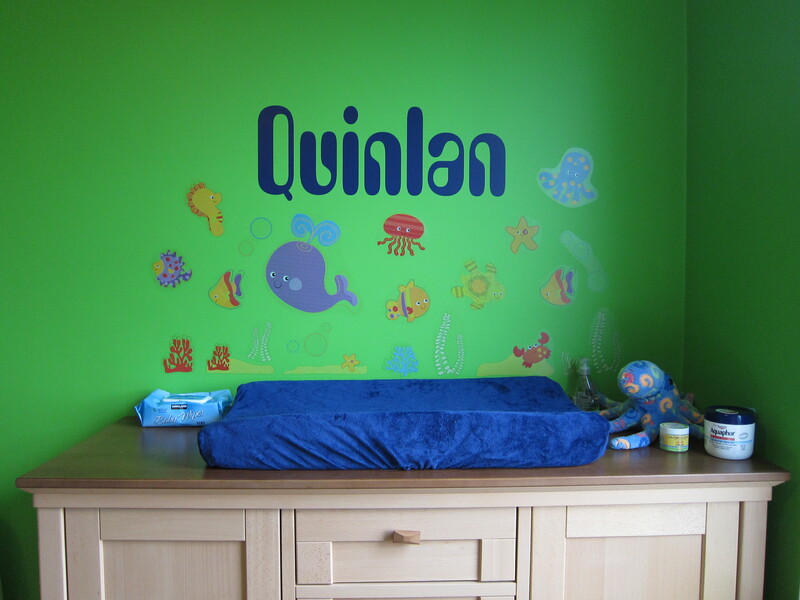 Had to show you Quinlan’s crib, though, which we love! It, as well as the changing station and the dresser, are from Romina’s Karisma collection. They have so many custom stain options – we went for a two-tone look, alberto puro with bruno antico trim. It is truly remarkable furniture. Mobile is another Fisher Price Ocean Wonders find. The giant submarine decal was found on Etsy, but is a custom size and color. 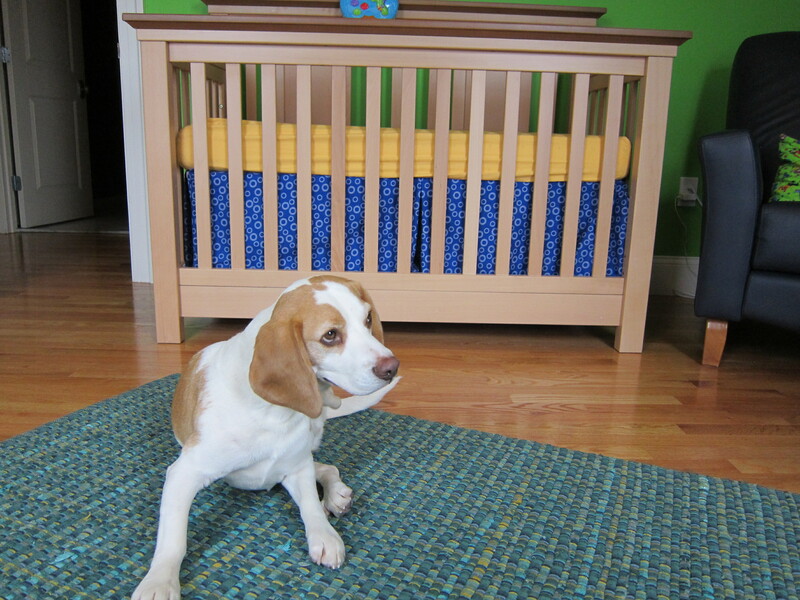 (Above) Big brother Harrison the beagle, scratching an itch in his new favorite room in the house. (Above) The big man himself, contemplating the toys in front of him and plotting the most direct route to get them. Thank you, Paula! You’ve been an inspiration to me since I can remember, in every way – including your decorating style! Thanks so much, Kristina. We love it, too. 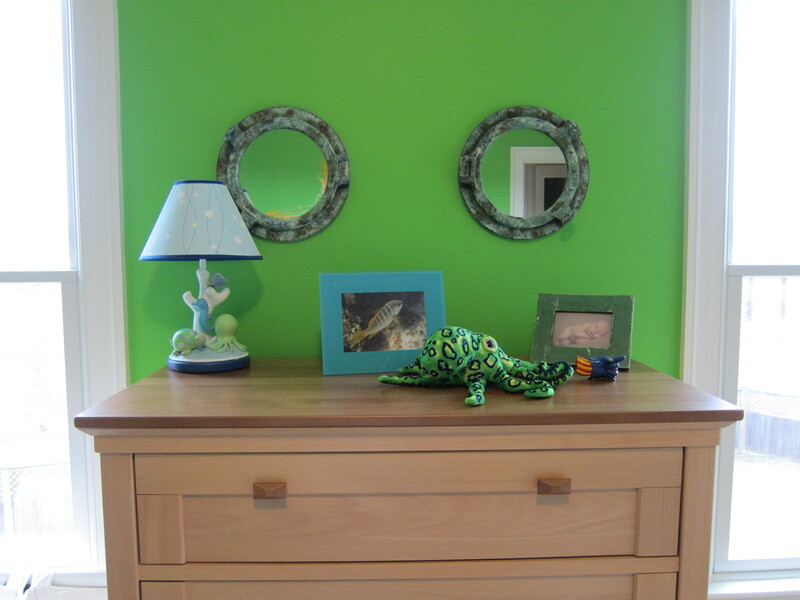 That color caused quite the debate over on Apartment Therapy when Quinlan’s room was featured there a few months ago! Would it be possible for you to tell me what pattern/color the baby’s bedding is? I’ve been on Carousel Designs website and I see the dot pattern but not that lovely blue color. We’re going to attempt to do a Yellow Submarine theme for our future son (likely to be named Harrison). Thanks! Hi Melanie – Congrats on the baby boy on the way! 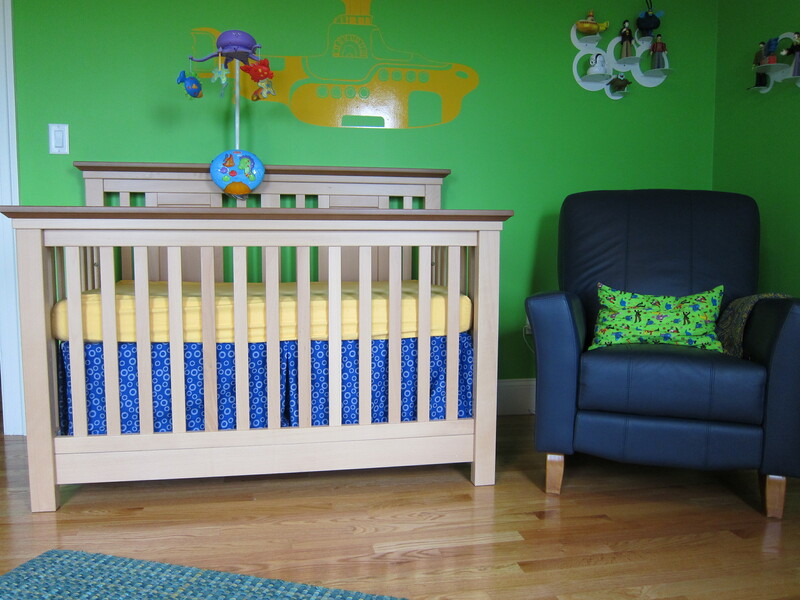 The crib skirt is royal blue with white circles (that’s the name), trimmed with solid cheddar. I am not sure if these fabrics are still available or not – they can change frequently. Good luck! Anyway, I love your room, too! I stumbled across your page because we are having another baby girl and I started thinking about a Strawberry Fields room for her. I googled it to see if there was any inspiration out there and found your room! Thanks for sharing! Thanks so much for your comment! I love the Beatles, and their music sure is full of decorative inspiration for juvenile spaces! 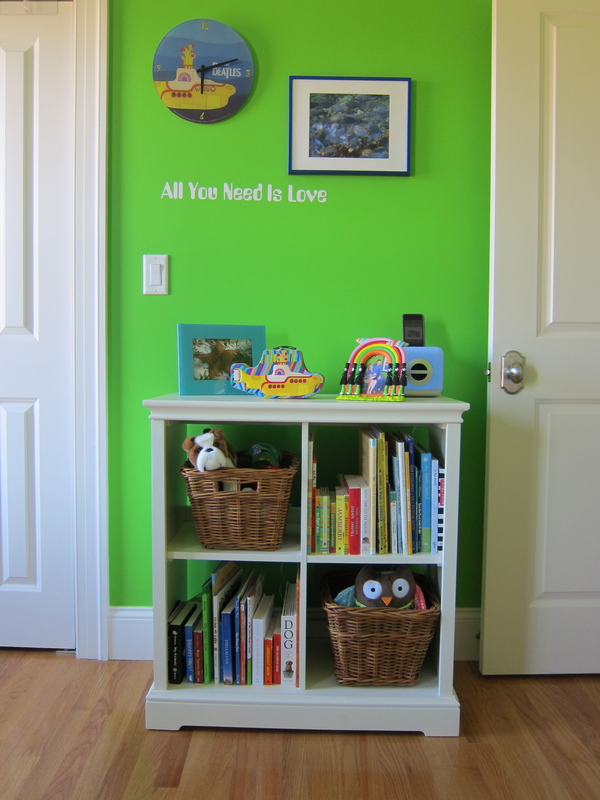 I am not sure exactly how you happened upon this post, but wanted to make sure you saw the one I wrote featuring a design mood board for an actual Strawberry Fields nursery – http://interiorsforfamilies.com/2012/05/24/nursery-theme-thursday-7-strawberry-fields-forever/. Good luck and have fun!